Overall stability and input data file compatibility improvements. You need to register again to download this new version. For bug reports and suggestions, please email to We hope you will like this new version! Most of the bioinformatic tools operating on DNA data assume that the sequences are trustworthy. However, raw data obtained from sequencing machines often violate this assumption. 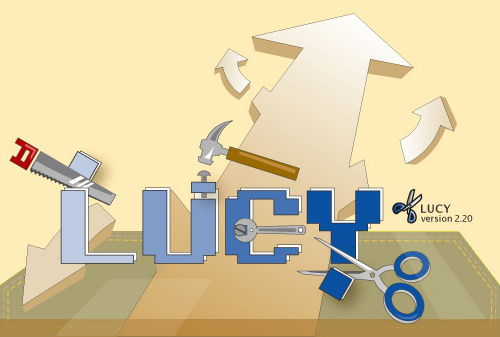 The tool Lucy1 was previously created to solve the raw data quality assurance problem. Lucy2 is a raw DNA sequence trimming and visualization tool based on the command-line tool Lucy1. Lucy1 was originally designed for high-throughput DNA sequencing centers to easily "plug-in" to their data streams; therefore it is operated exclusively through a command-line syntax. This style of operation was not suitable to individuals who may just like to trim a few sequences since it is inconvenient for users to operate with Lucy1 command-line syntax and to memorize its parameters. With Lucy2, these users can perform Lucy1's functionality through a much friendlier user interface. In addition, Lucy2 gives the option for users to physically remove the bad region before saving the data. Lucy2 is an open source project. The binary executable files are currently available on Windows, Linux and MacOS. Click on "Submit" and you should be taken to the download page where you can download Lucy2. We filter all incoming inquiry emails against our registration list to prevent spams. Therefore if you would like to send us a question in email, you need to register. Otherwise, we will not recieve your email inquiry. Your email address will only be used for this purpose. If you have forgotten your password, you can retrieve it by entering your email again. Your password will be automatically emailed to you shortly, then you can go to our download page to download Lucy2. For users interested in Lucy1 for their unattended sequence trimming, it can be downloaded directly from SourceForge. Song Li and Hui-Hsien Chou Bioinformatics, Nov 2004; 20: 2865-2866. Hui-Hsien Chou and Michael H. Holmes.Bioinformatics. 2001. 17(12):1093-1104.